We are accepting new students again so anyone interested in starting Jiu Jitsu at our gym, now is the perfect time. Currently we have 4 classes per week for adults. Thursday starting at 7:00pm Brazilian Jiu Jitsu with no gi. There is a fee of £15 for membership and insurance once you start training at our gym. performance evaluations where you train with one of the coaches and they will advise which areas need to be addressed and help you devise and implement a game plan. With the private lessons and seminars, you choose the content of the lesson, be it gi Jiu Jitsu, no gi or MMA, your choice. If you wanted to come and watch a session first, please let me know proir to turning up. 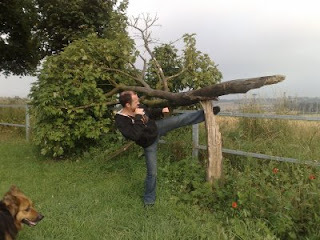 After years of diligent training every morning, I finally got the power in my round kick that I have trained so hard for. The results are obvious for all to see.